About ten years ago it was discovered to me through the immanent impulse of eternal Presence in my conscious and conscience that the very act of setting aside specific times and places in pursuit of spiritual nurture was a hinderance or impairment relative to spiritual being and sustenance. Even was discovered to me even 25 years ago and is discovered to me even today. There is a relationship, interaction, and unity with immanent Presence that is consummated in the laying down of all religious and political traditions, practices, ceremonies, and institutions that discovers and nurtures the immanent impulse in all interactions and circumstances. In this discovery, through immanent experience, all interactions and circumstances, in themselves,, are fertile ground for the increase of our measure of the light and the strength to lay down all special or set aside places, times, buildings, and intellectual constructs for spiritual nurture. In this different Life, itself in itself, the Life itself is become interjected all our interactions, relationships, and circumstances throughout daily life. To know the Life, in active living experience, during the very act of interacting with other is the sacred come into the world. The living experience in all things is the coming immanent eternal being into the world. I am come into the life and the life is discovered to me and in this Life all my interactions and circumstances are consummated in the living or experiencing of the Life itself. The immanent movement or impulse of the inshining Light itself in itself is my discernment, my meeting house, my special time and place. It is Life itself. It is love and life and in it are all things discovered and made manifest. This is my testimony to my witness. My question about this testimony is does it take one to know one, meaning do we recognize when others are living in the light without the burden of inward baggage? If so, whom might we link to Keith as likewise so enlightened? Meister Eckhart? Werner Erhard? The Pope? Actually I suppose there's no point in making such a collection. "What resonates in my own inward path?" is the more constructive question. Sometimes the language barrier is insurmountable. I'd have to hang out with Keith and have a beer with the guy to come to know what he means. Recording testimony on Q2, is of limited value, when it comes to conveying deep teachings. That's not a shortcoming of Q2 (QuakerQuaker) in particular, just the usual problem with the printed word (which people increasingly have little patience for in the first place as it's not television -- though it kind of is, given this screen I'm staring at, with its sliding surfaces). Kirby. There is not one single bit of a doubt that there is absolutely no language barrier between those who are coming into the Life; even between those who are coming into the Life but who have only experienced a small measure. I am currently in Central America and have had some very powerful interactions with people who know the sufficiency of the Life itself. Communion and fellowship with them, through the power, understanding, and knowledge of the inshining Light, has been and continues to be a blessing and it has increase in the the power and glory of the gospel Day in all interactions. The power of the Life itself in itself as sole guide and rule in the lives of people is come into the world and is coming into the present through the life and power immanent Presence beaconing through consummation in the consciousness and conscience of men and women. In this shared Life there is no language barrier, only manifest recognition, and fellowship and unity. In the life, the words fall away and shared immanent impulse is experienced as a new spiritual language independent of the mirrored outward constructs of the reflective language. I am come into (along with many others) the mystery of eternal immanent Presence itself in itself in all people. The Life is come and it is coming in this day. It is sustained and direct recognized independently of outward linguistic constructs. The Gospel day is among us. The power of the Eternal is come and is manifest in our world daily. The susfficieny of Life itself in itself is discovered to me in interactions with people from all. The Day-Spring is shining forth in the lives and interactions of people from all over the world. Yes Keith, I share your experience in some measure, of the sufficiency of Life itself, and I'm led to exult in various ways in my prose. It's just that whereas we may all drink from the same fountain, when we go to bottle it in the form of personal testimony, it invariably gains a flavor, some trademarks of the confessor, expositor, saint, sinner or whatever. You put your personal stamp on your experience, in using the specific language you do, as do we all. Ditto with clothing and hairstyle. To put it bluntly, I'd say you write for other Christians. Who could object? This is QuakerQuaker after all! What is discovered to me is that the “personal stamps” of which you speak is of no concern in a conscious anchored in and a conscience informed by immanent Presence itself in itself. While here, I have shared my testimony in various ways. It is discovered to me that the testimony, whether specifically Christian or of a more philosophical nature, in no way “flavors” the shared experience of the Life itself in itself. The pure experience or illumination blinds out the personal stamp or flavor in the manifestation of the Light. In fellowship with with others through the shared and mutual appearance of a conscious anchored in and a conscience informed by the Life itself I am come out the any and all personal flavors. When consummated in the Light itself no particular flavor or stamp is of any value. I am in the Light and I am the Light. The self-conscious ego is established in itself, independent of any and all intellectual constructs. This new and different life does not look back or reflect ... it is in itself. Those who are come into this life know a different being/Being. As for me, I still have my spiritual taste buds and don't intend on giving them up, as how I'm led by the Spirit is by my sense of sweet and savory (metaphorically speaking, but literally too). 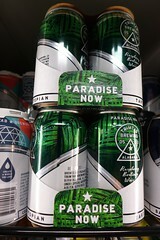 Some beers are too bland. Call me finicky . Call me "beer belly" (I'll consider it a term of endearment). 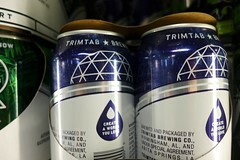 speaking of beer, I was gratified to find more testimony regarding Bodhisattva Bucky in Birmingham, Alabama in the form of TrimTab beer. "Call me Trimtab" its says on Bucky's gravestone. Drinking it was almost an experience of transubstantiation, if I may blaspheme a bit (Quakers shouldn't mind, not being theological purists). It is true that the what can be said can be said clearly, it is also true that what cannot be said by one clearly can still be said by another and clearly. It is true that what some cannot say ... others can. It is also true that for some people things worth saying are not sayable. For others, things worth saying are extremely sayable. Otherwise, why even say things worth saying are not sayable? It is also true that some people speak in hints which are helpful, however so is full revelation. Through the appearance of the Life itself in itself the consciousness and conscience is free from the limitations of conformity to outwardly reflected maxims. It is the prerogative of immanent Presence in the conscience and consciousness that manifests the unsayable and the sayable according to the measure of Light in each person and no maxim can contain meaning and sayability in the Life. There times when , what for one person is convoluted and lacks meaning, for another, the same words bring understanding and knowledge and increased spiritual experience. For many, the Life itself in itself shatters dependency and reflections upon half-truths that serve to hinder the fullness in the Life.